Yesterday was father’s day here in the states. We spent most of it driving back from the beach. 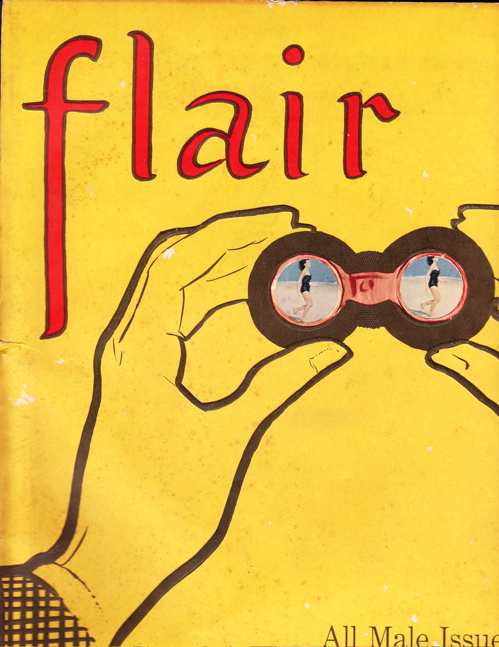 Upon our return, and after the drudgery of unpacking, Mrs. E. presented me with a gift… the July 1950 “All Male Issue” (how different that sounds today) of “Flair” magazine. What a gift! 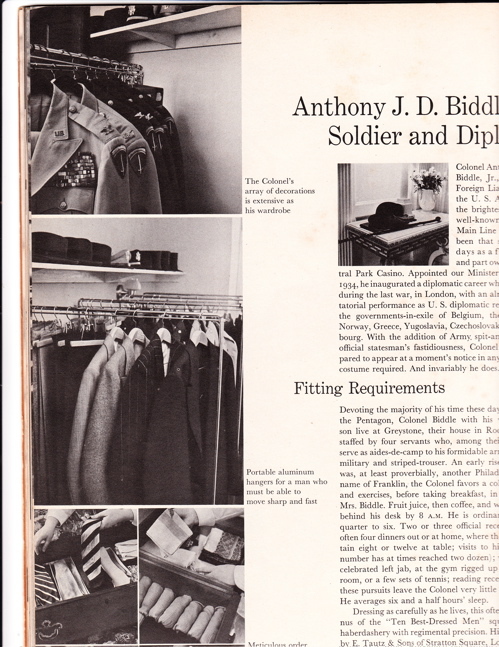 Colonel Anthony J. Drexel Biddle Jr., currently the Foreign Liaison Officer of the U.S. Army, is one of the brightest lights of the well-known Philadelphia Main Line family and hs been that since his ealy days as a fight manager and part owner of the Central Park Casino. 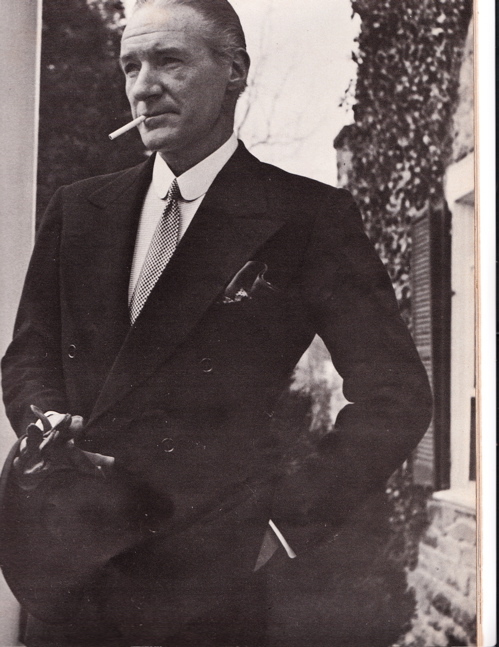 Appointed our Minister to Norway in 1934, he inaugurated a diplomatic career which culminated during the last war, in London, with an almost prestidigitatorial performance as U.S. diplomatic representative to the governments-in-exile of Belgium, the Netherlands, Norway, Greece, Yugoslavia, Czechoslovakia and Luxembourg. With the addition of Army spit-and-polish to his official statesman’s fastidiousness, Colonel Biddle is prepared to appear at a moment’s notice in any setting, in any costume required. And invariably he does. Devoting the majority of his time these days to his desk in the Pentagon, Colonel Biddle with his wife and baby son live at Greystone, their house in Rock Creek Park, staffed by four servants who, among their other duties, serve as aides-de-camp to his formidable army of uniforms, military and striped-trouser. An early riser (by 6:30) as was, at least proverbially, another Philadelphian by the name of Franklin, the Colonel favors a cold morning tub and exercises, before taking breakfast, in his robe, with Mrs. Biddle. Fruit juice, then coffee, and without fail he is behind his desk by 8 A.M. He is ordinarily there until quarter to six. Two or three official receptions weekly; often four dinners out or at home, where the Biddles entertain eight or twelve at table; visits to his clubs (whose number has at times reached two dozen); working out his celebrated left jab, at the gym rigged up in his dressing room, or a few sets of tennis; reading recent nonfiction — these pursuits leave the Colonel very little time for extras. He averages six and a half hours’ sleep. Dressing as carefully as he lives, this often-chosen alumnus of the “Ten Best-Dressed Men” squares away his haberdashery with regimental precision. His suits are made by E. Tautz & Sons of Stratton Square, London; his sport clothes by H. Harris of New York. Shirts, including the famous ones with horizontally striped, starched bosoms come from Charvet in Paris. This entry was posted in Elegantology and tagged "Flair" Magazine, A.J. Biddle. Bookmark the permalink. 14 Responses to Icon, Icon A.J. I just loved Flair magazine! I am so envious of you copy! Biddle really was extraordinarily well dressed. Better still, however, was William Rhinelander Stewart. I am so jealous! Maxminimus also has a copy. Hope you had a great week at the beach! I would love to get ahold of one of these copies, I have the Flair 1953 Annual book. Superb Gift! I had 20 hardbound Apparel Arts issues years ago. Don’t ask what happened to them. Too painful. I’ve gotta send you Richard Merkin’s article on Biddle’s overcoat. I read that Merkin article in an old GQ when I was very young and it fascinated me! What issue was it may I ask? Another great post, did you happen to read George Frazier’s article “The Art of Wearing Clothes.” I believe it was in Esquire from 1960. He gives a complete rundown on Biddle’s wardrobe. ADG, I’d love to read it. It’s been years since I tossed all those old GQ’s. Wish I’d saved Merkin’s stuff. Although I do have CG’s final interview issue somewhere. E….Send me an email … have I got a treat for you. Yes, I have the Esquire issue with Frazier’s famous treatise. I also have the original 1960 Esquire with the great Frazier article, and just ordered the 7/50 Flair on EBay. Richard M, Lucky man! Welcome and thanks for commenting. A belated thank you. Also just acquired the Look magazine issue March 23, 1965, with article and pics of T. Reed Vreeland, another of Frazier’s best-dressed.